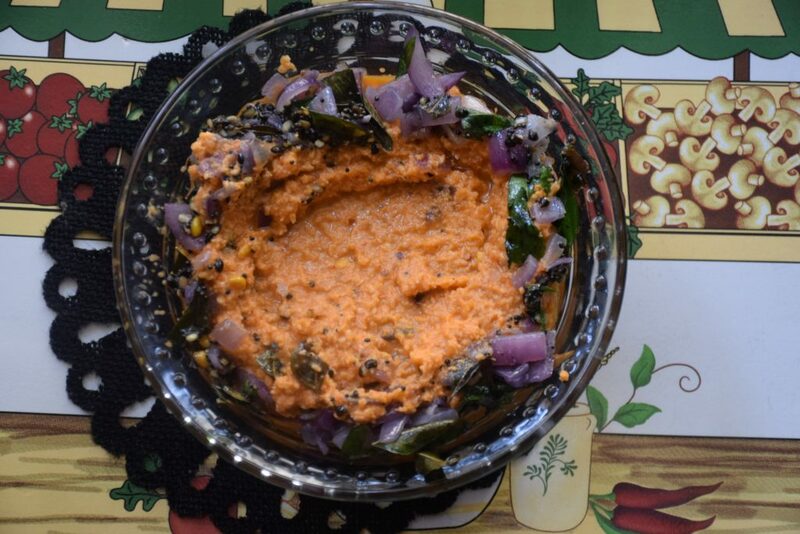 Home-made Chutneys (dips) are not only delicious but also long-lasting. You can customize them according to your taste palettes and devour them without any concern. 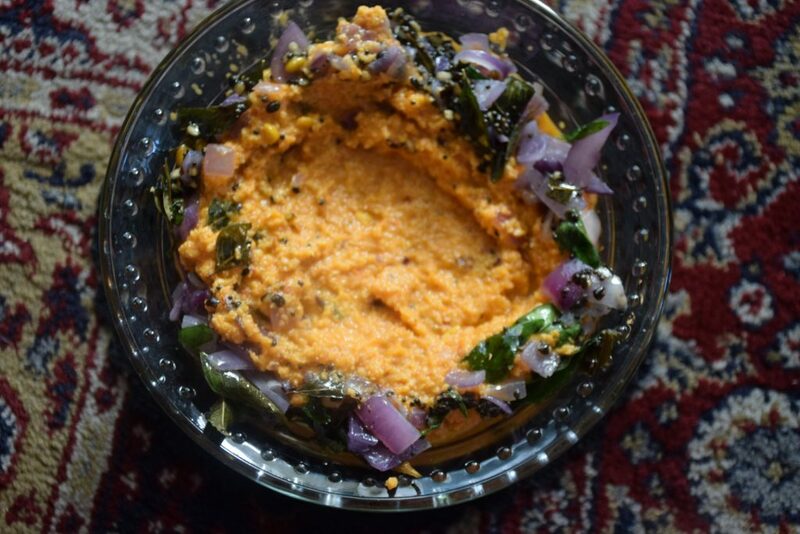 Red Coconut dip is a South-Indian dip popular in most of the Indian eateries for its vibrant reddish-orange color and unique flavor. 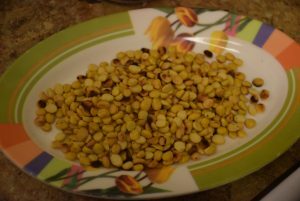 I first tasted it when I was too young about 8 or 9 years old in “Saviraj” restaurant in Andheri , Mumbai. But tried my hands on it only after marriage. For my daughter, this chutney is “Shahi Paneer“. :D.
1. We start with dry roasting the ingredients first. 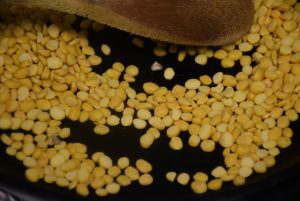 Roast the chana dal (daliya) in a wok (kadhai) till it changes color slightly. 2. 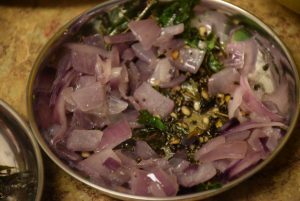 Then roast the black Urad dal and keep aside. Keep stirring all the time. 4. 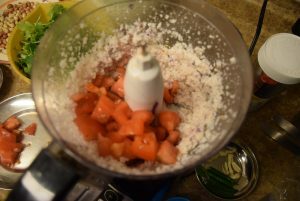 Now add the fried onions, tomatoes in a blender or food processor. 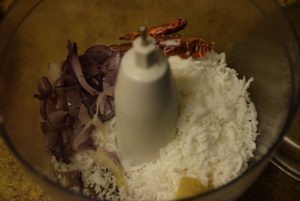 Alongside add the freshly grated coconut, ginger, whole red chillies ,salt and chaat masala. 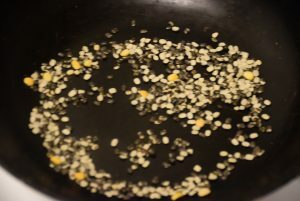 Pulse them in a fine paste , add water as needed. 1. For this we will heat oil in a wok(kadhai) again. 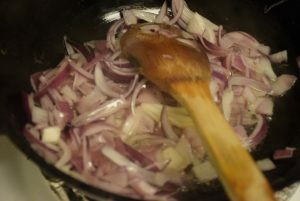 Add the mustard seeds, hing,curry leaves and onions on medium heat. 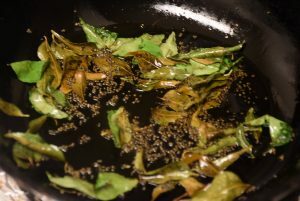 Add the next ingredient only when mustard seeds start crackling. 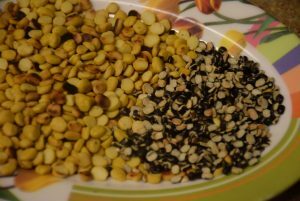 You may add the chana dal and urad dal in this mixture for roasting , or may dry roast them like I did previously. 2. 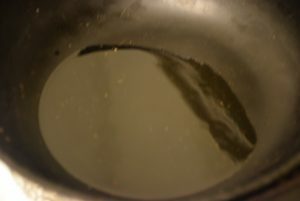 Stir this tempering(tadka) for 3 mins. 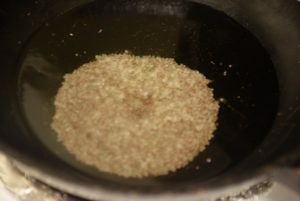 Then sprinkle it over the dip made from grinding. 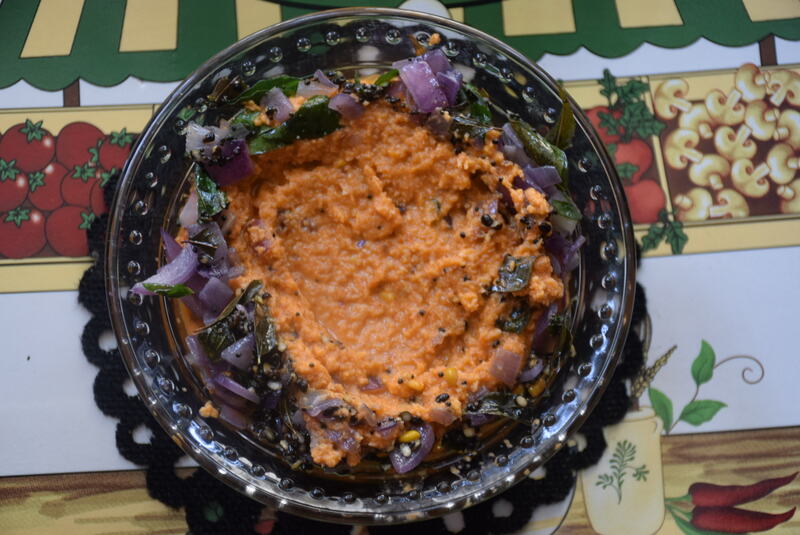 Serve this lip-smacking red chutney with Medu vada, Idli or Dosa. Enjoy and share your experience here. 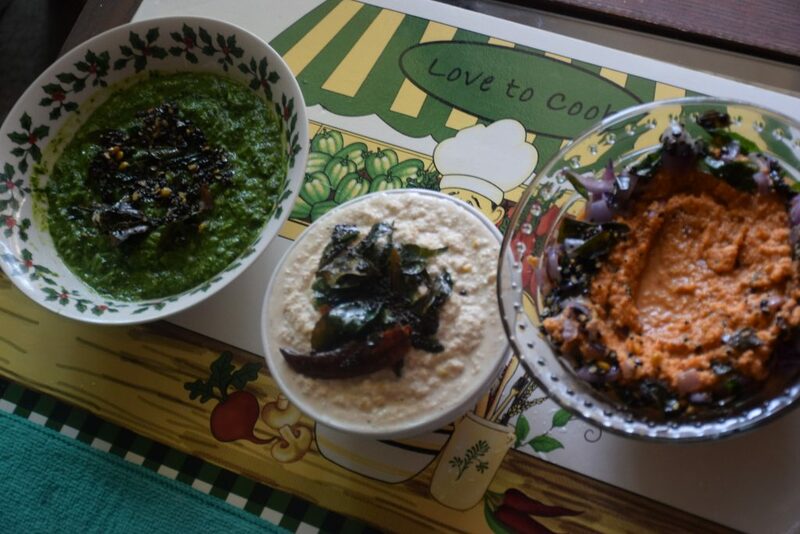 This entry was posted in Dips and pickles, Food, Recipes and tagged abundant, accompaniment, Carenshare, Dassana Amit, delicious, dip, dosa, fresh, idli, long-lasting, medu vada, Red coconut chutney, sambhar, shahi paneer, shweta jindal, side, South-Indian, sweet, tangy, uttappam, Vada, Veg recipes of India, zindagisikhati.